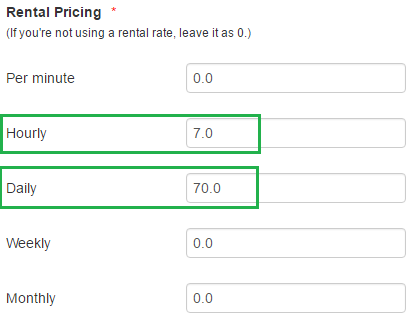 EZRentOut offers flexible ways to set up pricing. The pricing model requires that each Asset (and Asset Stock entry) have its individual rental rates. Let’s take the example of a bike rental shop where we have Road Bikes, Mountain Bikes, and Beach Cruisers. We’ll use different rate examples to show how they can be laid out. Using the table below, determine the pricing structure that you have, and then jump directly to the relevant section. Similarly, you can set the $5 per hour rate for the Road Bikes. Since rates are item level, every asset (or asset stock) will need this rate. 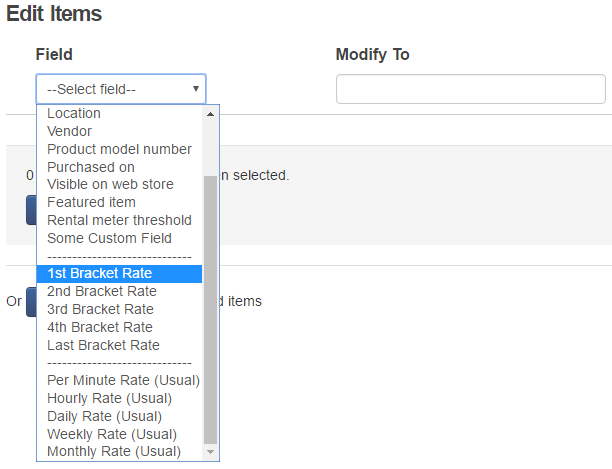 To quickly set up rates in bulk, see the last section of this article. 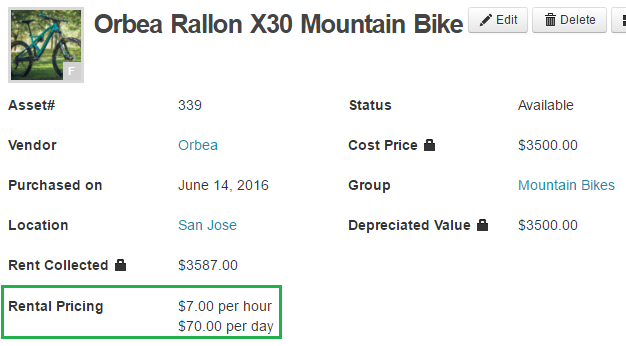 To rent out a mountain bike at $7 per hour and $70 per day, specify both the hourly and daily rate when adding/editing a mountain bike asset. * To use Best Pricing, enable this option from the Add Ons. Best pricing gives a rate that’s lower. 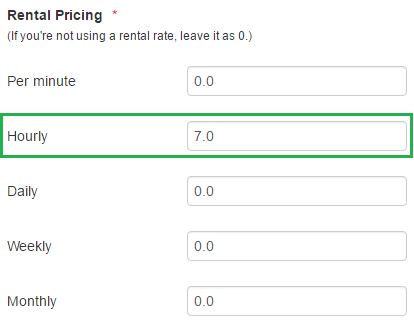 To get started, enable the advanced pricing from Settings –> Add Ons –> Advanced Rental Rates. Make sure to scroll down and save the settings. In this example, we’ll have all the Road Bikes in the road bikes group, and all the mountain bikes in the mountain bikes group. Here’s what we should do for Mountain Bikes. Now that we have brackets, the price can be defined for every asset or asset stock while adding/editing it. This a variation of what’s described in section 3 above. 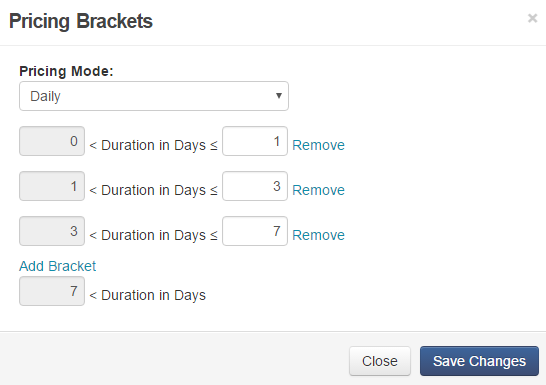 Read through section 3 to see how brackets are configured. The only difference is that, when specifying rates, choose a flat rate where required. $70 flat for 1 day. $100 flat for 1 to 3 days. $170 flat for 3 to 7 days. $60 per day for any time greater than a week. 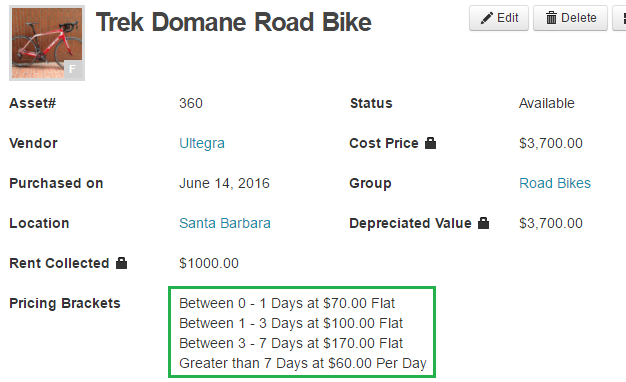 When creating a road bike asset or editing it, rates can be specified. You can select a number of items on the asset/asset stock list and update their pricing by choosing the mass edit option in the Actions Dropdown. 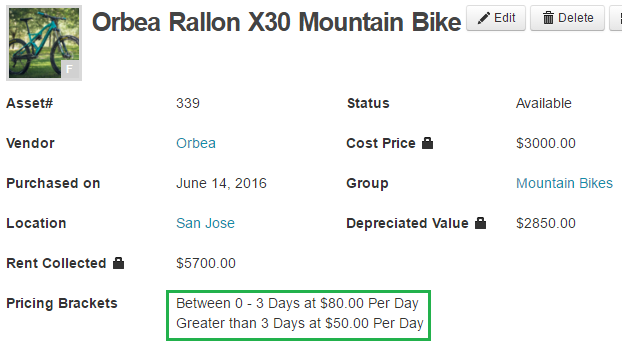 Say you want to update the pricing for all mountain bikes. You can go to the Mountain Bikes group, select all items on a page, and from Actions dropdown, choose Edit. Note that page size can be increased to 100 records per page if you want to select more items in one go. 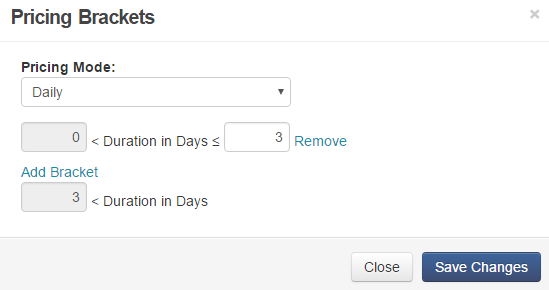 This setting is available under Settings –> My Settings –> Misc –> Maximum Records per page. 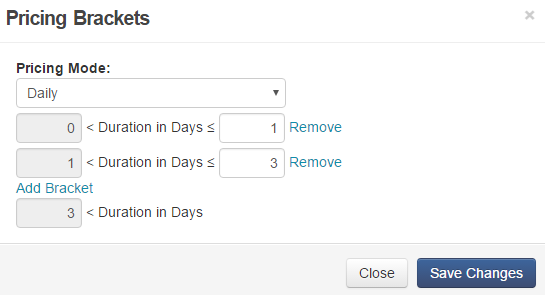 From mass edit, you can also choose whether to apply usual rates (scenario 1 and 2) or advanced ones (scenario 2 and 3). Pricing can also be set while importing or updating items from excel. This entry was posted in [Support], Equipment Rental, Rental Pricing by admin. Bookmark the permalink.